A fluid inclusion acoustic decrepitation study. 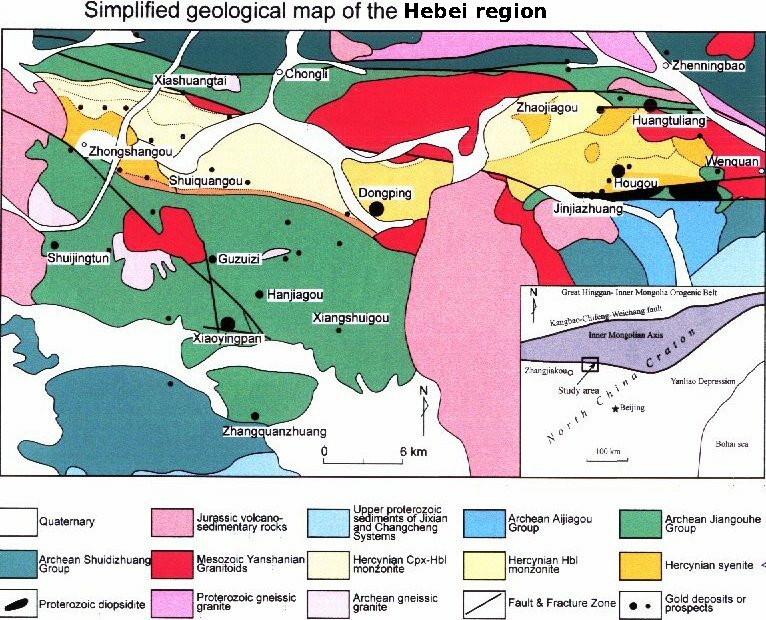 A number of gold deposits occur in an area about 200 Km north west of Beijing, near the northern margin of the north china craton. The deposits at Dongping, Huangtuliang and Hougou were visited and samples collected for acoustic decrepitation studies during September, 2005. These deposits occur within middle Palaeozoic Syenite or Archaean basement host rocks and the mineralisation event at Dongping mine has recently been dated as Jurassic and clearly unrelated to the host syenite emplacement event. (Hart et. al, Mineralium Deposita, V37, p. 326-351). A total of 34 individual rock samples was collected from 7 locations. Multiple samples are collected at each location to provide information on small scale homogeneity, as well as ensuring unbiased representation at each location. Ideally, monomineralic quartz samples are collected, but quartz was sometimes scarce in these mines and many whole rock samples of combined quartz and feldspar were also used. Quartz is only heated to 620 C during the analysis but when other host mineral phases are present the samples are heated to 800 C.
Decrepitation analysis procedures and meaning of the results. The main observation from my results is that the depositional fluids in all of these mines lack significant amounts of CO2. 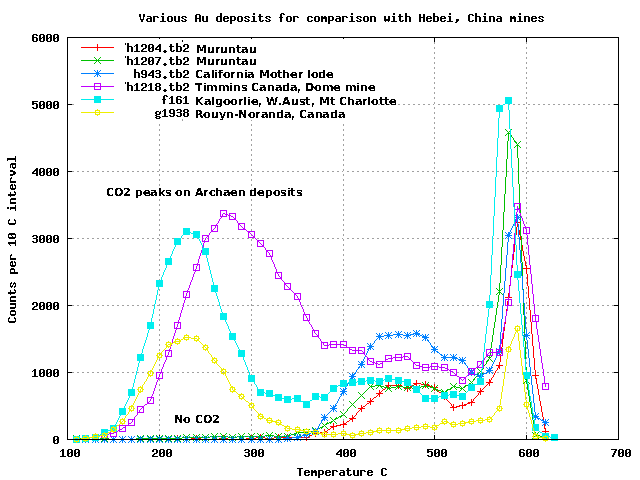 If CO2 is present in the fluids, the decrepitation results show a distinct peak between 200 and 300 C, (explanation) and as seen in the graph of samples from archean gold deposits. This lack of CO2 also occurs at Muruntau and the Motherlode deposits in California and so I infer these deposits share a similar fluid genesis. In general, fluids derived from metamorphic zones greater than lower greenschist facies would be expected to contain CO2. The formation temperature of the Dongping deposit is about 350 C (the beginning of decrepitation) while the Hougou deposit may have formed from a slightly hotter fluid at about 370 C which also contained a trace of CO2. Although the Dongping and Hougou fluids are reasonably similar, note the very low decrepitation in quartz at Huangtuliang. This mine had much less quartz veining and I had some trouble getting many samples of quartz there. The 2 samples I did obtain both had very low inclusion abundances. This quartz did not seem to be sheared and looked somewhat cherty and this deposit probably formed at a much lower depth or from a vapour dominant fluid system - either condition gives much lower decrepitation intensity. However, its formation temperature was still about 350 C.
Several fluid inclusion studies on these mines mention the presence of CO2 rich fluids in the inclusions, inferring the importance of such fluids in the ore genesis. However, these deposits actually formed from fluids with very low CO2 contents and only a few of the samples show very low partial pressures of CO2 in their fluids. When performing manual microthermometry studies it is all too easy to focus on the peculiar inclusions and obtain a distorted impression of the fluid system. The decrepitation data, being the results of many more individual samples and many thousands of inclusions in each sample give a much more realistic representation of the fluids, which are not actually CO2 dominant at all in these mines. The low levels of CO2 in the parent fluids of these deposits indicates that the main fluid source is unlikely to be of metamorphic origin, unless it is barely much more than diagenesis, as such fluids would be expected to contain significant amounts of CO2. Porphyry copper style deposits (high level magmatic) also lack significant CO2 in their fluids and perhaps shallow magamtic systems are the source of the fluids. This would agree with the inferred relationship between the age of the mineralisation and "late Jurassic to early Cretaceous crustal-melt granite dykes and stocks" in the region as reported by Mao et. al., Economic Geology, V98, 2003, p 517-534. In view of the low CO2 contents of the fluids in these deposits, I infer that the preferred exploration target is for structurally favourable regions related to and/or close to the late intrusives in the district. These late stage intrusives seem to be the fluid source for these deposits, rather than any metamorphic fluids. Samples were obtained from the #70 body underground workings, both within the main ore zone which was about 30 metres thick here, as well as just outside the grade cutoff limit (1 gm/tonne) of the ore zone. These 3 samples of quartz show no low temperature decrepitation at all and lack CO2. However 2 of these samples had contained carbonate and were washed in acid to remove this prior to analysis. The formation temperature of the quartz is about 350 C, the start of significant decrepitation. Four more samples from the ore zone were of a mixture of quartz and feldspar, with quartz being dominant. The peak at 590 C is caused by the alpha -> beta phase transition in quartz. The decrepitation response of the feldspars has not interfered with the response from inclusions in quartz and the formation temperature is still seen to be about 350 C with no CO2 present. Three more samples from the ore zone show no distinct quartz phase transition peak at 600 C and have only weak silicification. However the formation temperature can still be determined as about 350 C.
Three samples of quartz from the margin of the economic ore zone, just outside the 1 gm/tonne cutoff point are probably indistinguishable from the quartz collected well within the ore zone (sample 1864 above). However 1865A (red graph) does have a lower than usual formation temperature of about 300 C. It is possible that there is a temperature decrease as we progress outside the ore zone, but there are insufficient samples in this study to be sure of this. Several samples were taken from the ore trucks waiting at the shaft. It is impossible to be sure of the precise origin of these samples, but the 2 quartz samples (red and green) show minor decrepitation around 250 C and traces of CO2 are inferred to be present in this quartz. The quartz formation temperature is still about 350 C. Sample 1863C was analysed twice (blue and magenta) and seems to be comprised entirely of feldspar. Note that the instrument reproducibility of the 2 analyses of the same sample, which were actually done on separate days, is quite good. H1869 Sample# 1863C Ch5FT7 0.5g -420+200 Trace CO3=??? Samples from the old surface workings once again lack any CO2 and have a formation temperature of about 350 C.
At this mine, quartz was quite scarce and only 2 clean quartz samples were collected, the remainder being feldspar dominated. The 2 quartz samples (red and green) both had anomalously low decrepitation intensity. The hand sample descriptions show them to be a cherty quartz rather than a typical vein quartz. This low decrepitation intensity may be due to a much higher level of emplacement, or a vapour dominant fluid system at this mine. The fluids here are quite different to the other 2 mines in this study. These feldspar dominated samples still show decrepitation commencing at about 350 C, and it seems that despite the differences in the fluids, the deposit was still formed at about 350 C.
H1880 Sample# 1868A Ch5FT7 0.5g -420+200u trace CO3=?? H1881 Sample# 1868B Ch5FT7 0.5g -420+200u trace CO3=?? There was an abundance of quartz in stockwork veins in this mine, and many of the samples show minor decrepitation around 250 C, indicating the presence of small amounts of CO2 in the fluid inclusions. The start of intense decrepitation also seems to be a little higher than the other mines and the formation temperature of this quartz is about 370 C.
Other gold mines which lack significant CO2 occur at Muruntau (red and green) and the Motherlode in California (blue). However, most Archaean deposits have quite high CO2 contents in the fluid systems as seen in these examples from the Abitibi district in Canada (magenta and yellow) and from the Kalgoorlie region in West Australia (cyan).